I've held off on reviewing Captain Marvel for the past few months because I was, for a time, confused by its' storyline. The book opened up simply enough, with Carol Danvers being quickly established as a tough, no-nonsense career soldier turned superhero. Things became a little more complicated as Carol, in the midst of trying to top a flight record unofficially set by her childhood idol (pilot Helen Cobb) became lost in time and wound up partnering up with a group of all-female pilots in World War II against a group of Japanese soldiers equipped with alien technology. Issue 4 continued the storyline, with Carol continuing to fight alongside the "Beautiful Banshees" until she had a vision of her plane overhead. Her attempts to catch up with it sent her through time again, this time winding up in the United States at a time when Helen Cobb was fighting for the right of female pilots in the USAF to fly jets and get the experience needed to become astronauts. Somehow, Carol is able to enlist in the same program and winds up befriending her idol, all while trying to learn the history of an alien artifact that Helen Cobb may have come into contact with. 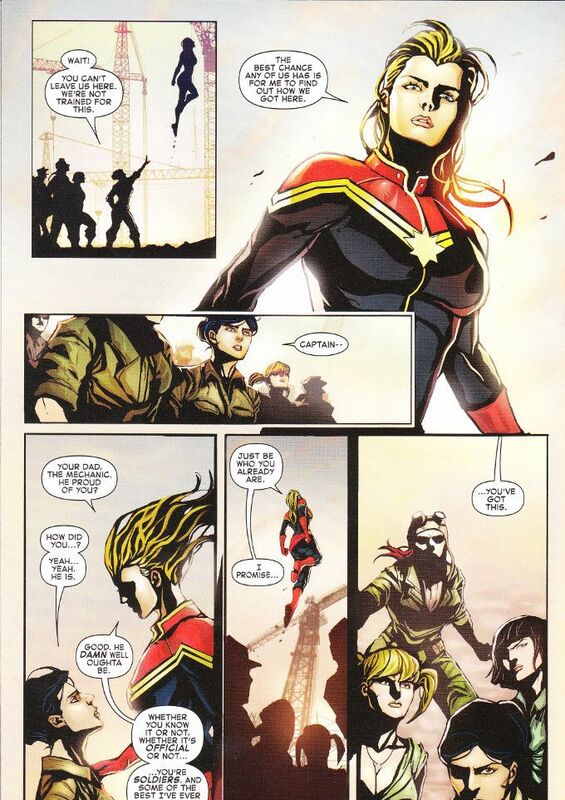 This adventure makes up the action of Captain Marvel #5. 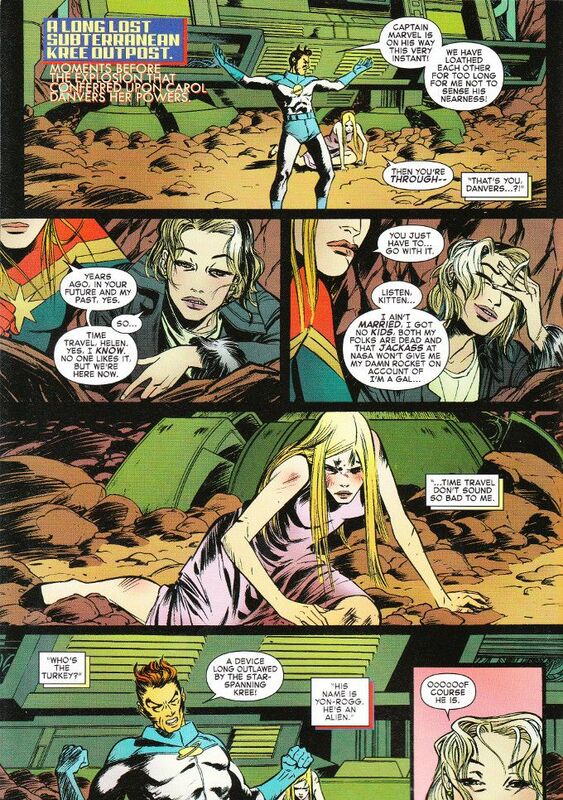 Captain Marvel #6 sends both women forward in time to the moment when Carol Danvers gained her super-powers. Where it goes from here, I shall not say. Suffice it to say, whatever confusion I experienced in the earlier issues was banished by the issue's end. 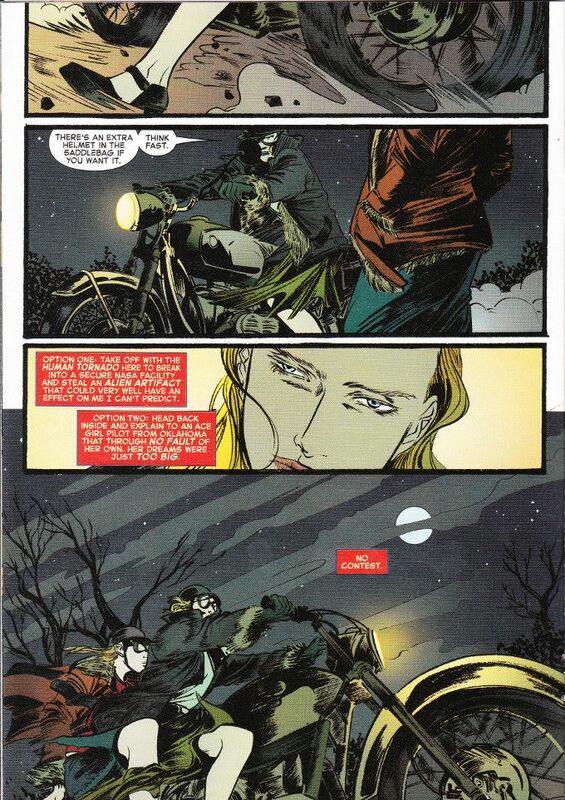 Kelly Sue DeConnick wrote a great story here, though the latter chapters scan far more easily in one sitting. If you haven't picked this book up yet, you might wait for the inevitable TP collection. I think it will be worth the wait. The artwork is primarily provided by two different but skillful artists. Issue #4, whose main story was drawn by Dexter Soy, offers more of the stylized painted artwork that wowed me in the first issue. Al Barrionuevo and Will Quintana produced the artwork for the flashback sequences at the issue's end, offering a more classic comic book style than Soy. Issues 5 and 6, penciled by Emma Rios with inks by Rios and Alvaro Lopez, are more Mangaesque in appearance, looking not unlike some of the early Shojo created by the Fabulous 49ers. It's a different choice for an American comic-book, but an effective one. All in all, Captain Marvel's been an interesting read. It might not be everybody's cup of tea but I appreciated the story, which proved quite accessible to someone like me who hears the name Captain Marvel and thinks Billy Batson. Give it a shot once the trade comes out.